Read Neck Pain – Not This Summer! provided by Care Medical Center Staff to learn more about Care Medical Center and our Chiropractic office in Valdosta, GA.
We all love summer vacations filled with the fun of amusement parks and long days on the beach. At least, we use too. As children, we could not wait to get on the newest and fastest roller coasters and be thrown around on the lake on water skis and tubes. But as we have become older, we find ourselves saying more often, “I’ll just watch you,” as we know that participating in those events could cause us to suffer from neck pain and headaches for days. If you find that you are finding yourself more often as the spectator due to the fear of injury, read on as we find the causes of the “how” and “why” and no, it is not just because we are getting older. A whiplash injury refers to a group of injuries that occur as a result of a sudden, violent whipping motion of the head. The whip can happen in any direction – back-forward, forward-back, side-side, or anything in between. Various injuries can result, including damage to the supporting muscles, ligaments and other connective tissues in the neck and upper back. When this injury or micro-injury occurs a host of related symptoms may then begin which could include neck pain, muscle stiffness, and headaches. 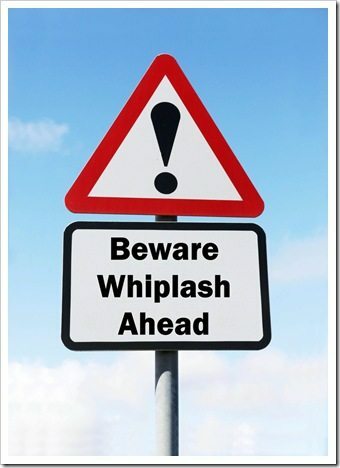 Whiplash injuries most often result in a sprain-strain of the neck. This sprain occurs when the muscles and ligaments that help support, protect, and restrict excessive movement of the vertebrae are strained or stretched beyond their normal limits. The joints in the back of the spine, called the facet joints, are covered by ligaments called facet capsules, seem to be particularly susceptible to whiplash injury. The nerve roots between the vertebrae may also be stretched and become inflamed. Spinal discs between the vertebrae, which are essentially ligaments, can also be torn, potentially causing a disc herniation or worse fractured or dislocated. The symptoms are heightened and more prevalent in degenerated spines which are already under the stress of misalignment, disc thinning, and spinal vertebrae bone changes which are often accompanied with arthritic calcification. Degeneration of the spine is not based on age but life’s experiences and activities. If you do suffer from a minor whiplash injury, one of the most important aspects of whiplash management is for the patient to remain active unless there is some serious injury that requires immobilization. Once you have had your spine checked, your chiropractor will often prescribe an exercise or stretching program. It is particularly important to follow this program as specified so that you can achieve the best long-term benefits. Chiropractic treatments provided by a chiropractor will provide neck pain relief and begin structural corrections of any misalignments that are identified. Ice and/or heat are often used to help control pain and reduce the muscle spasm that results from whiplash injuries. Other physical rehabilitation modalities may also provide short-term relief. They will, however, be very complimentary to an active-care program of exercise and stretching. Summer Time Blues – No More! Although prevention is the best solution, if you do become over exuberant this summer and suffer what you could categorize as a neck or whiplash injury see a Chiropractor, who is a trained expert in spinal and musculoskeletal conditions. With the use of chiropractic care, they will restore the normal movement and position of the spinal vertebrae. Restorative treatment may include massage therapy, trigger point therapy, exercise rehabilitation and other soft tissue rehabilitation modalities. This entry was posted on Thursday, August 10th, 2017 at 6:32 am and is filed under Health Articles. You can follow any responses to this entry through the RSS 2.0 feed. You can skip to the end and leave a response. Pinging is currently not allowed.